above, for example, Landsat Thematic Mapper at 80 m and the Systeme Probatoire pour l'Observation de la Terre (SPOT) at 1.0 m. The multi-spectral sensors provide the capability to map snow based on the specific spectral signature of snow. For a subpixel analysis of snow-covered areas a high number of spectral bands is of great value for use in spectral unmixing algorithms, i.e. for decomposing the effective spectrum of a single pixel into its primary spectra related to the different snow-free classes present (spectral end members) (e.g. Nolin etal., 1993; Rosenthal and Dozier, 1996: Dozier and Painter, 2004). However, the disadvantages include a limited opportunity to view the snow surface when the low temporal resolution, up to 18 day repeat times, is combined with the problems associated with cloud cover. These limitations, plus the typically greater cost of these high spatial resolution data sets, have limited their use to local and short-term experimental applications. In locations where accurate snowmelt runoff forecasts are required for hydropower management the regional-scale application of satellite data often plays a very important role. For example, Norway is one of the most active countries in the application of visible remote sensing where programs are numerous and include e.g. Statkraft SnowSat System, the NVE Snow Cover System, the Cap Gemini Snow View Information System, Tromso Satellite Station Basic Snow Cover Map, and the Norwegian Meteorological Institute daily and weekly maps (Solberg et al., 1997). In the United States, the National Operational Hydrological Remote Sensing Center (NOHRSC) of NOAA provides routine products based on AVHRR, and GOES visible satellite data as well as SSM/I satellite data, airborne gamma ray observations, and surface station data. Because of the ability to penetrate clouds, provide data during darkness and the potential to provide an index of snow depth or water equivalent, passive microwave satellite remote sensing can greatly enhance snow measurements based on visible data alone. Reliable, multichannel, global passive microwave satellite data first became available with the NASA SMMR (scanning multichannel microwave radiometer) instrument during the period 1978-1987 (Gloersen et al., 1984; Hall and Martinec, 1985), followed by the DMSP (defense meteorological satellite program) SSM/I (special sensor microwave/imager) from 1987 to 2008 and beyond (Hollinger et al., 1990). The SMMR and SSM/I instruments provided a combined range of microwave frequencies from 6 to 89 GHz in both horizontal and vertical polarizations. Techniques used to derive snow parameters from passive microwave data have relied most heavily on channels at 18-19, 37, and 85 GHz. When snow covers the ground, the microwave energy emitted by the underlying soil is scattered by the snow grains. Therefore, when moving from snow-free to snow-covered land surfaces, a sharp decrease in emissivity and associated brightness temperatures provides an indication of the presence of dry snow (Matzler, 1994). In addition, snow exhibits a negative spectral gradient which means that as the microwave frequency increases, for example from 19 to 37 GHz, the emissivity and associated brightness temperatures decrease. Brightness temperature is the product of emissivity at the given microwave frequency and the physical temperature of the target (Staelin et al., 1977). Nearly all other land surface types exhibit a positive spectral gradient. Theoretical and empirical studies have demonstrated that the amount of scattering, or decrease in brightness temperature, can be correlated with the thickness and density of the snow cover and specific wavelength. Based on these relationships, algorithms have been developed that indicate the presence of snow (Grody and Basist, 1996; Hiltbrunner, 1996) and compute either snow water equivalent or depth, given an assumed density (examples include, Chang et al., 1987; Goodi-son, 1989; Nagler, 1991; Tait, 1998; Pulliainen and Hallikainen, 2001). Nearly all of these algorithms have been developed and tested for dry snow conditions only. Snow water equivalent cannot be determined when the snow is wet (i.e. liquid water is present on the snow grain surface) because wet snow is primarily an emitter at microwave frequencies and thus the information derived from the scattered portion of the signal is lost. However, it is still possible to detect the presence of wet snow due to its high polarization difference (Walker and Goodison, 1993; Matzler, 1994) and emission signature (Basist et al., 1998). Validation of this microwave data set has been accomplished by comparisons with the weekly NOAA snow extent data set described above (Armstrong and Brodzik, 2001a, b). This study compared data derived from two satellite products which involve completely different sensor systems and analysis techniques. 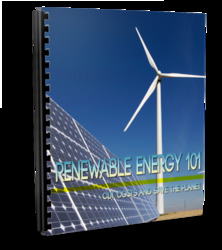 The visible data are manually interpreted while a single numerical algorithm is applied to the microwave brightness temperature record throughout the time series. In the comparisons shown here (Fig. 5.3) the Chang et al. (1987) snow depth algorithm is used to determine snow extent for the SMMR period and a modified version of the same algorithm is used for the SSM/I period (Armstrong and Brodzik, 2001a). 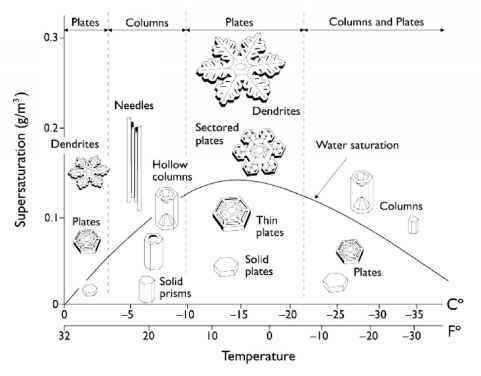 Since it is the mass of snow that essentially controls the scattering of microwave energy in a snowpack, derivation of snow depth from passive microwave data requires that certain assumptions be made about snow density and grain size (Matzler, 2002). For example, the global SSMR-derived monthly snow depth climatology used by Foster et al. 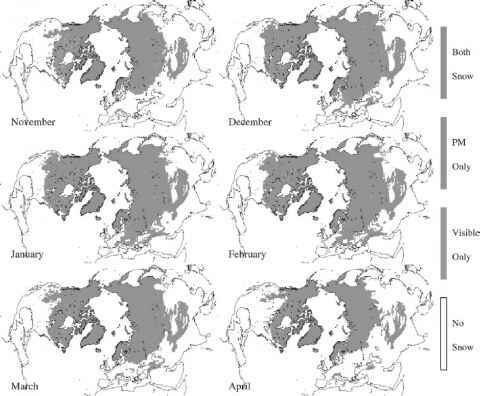 (1996) assumed a mean snow density of 300 kg m-3 and an average snow grain size of 0.3 mm (Chang et al., 1987). Thus passive microwave-derived snow depths have additional sources of uncertainty included in them. suited to detecting shallow snow, they also monitor the fluctuating snow extent edge more precisely, resulting in greater spatial variability. This is the probable reason for the NOAA data indicating greater departures from the monthly means (Fig. 5.5) as the region of most rapid fluctuation in snow cover is typically the snow-edge boundaries where the snow is thin and intermittent. Therefore it is likely that the large differences in snow extent during fall and early winter are due primarily to the inability of the current passive microwave algorithms to detect thin and intermittent snow cover. A similar pattern during fall and early winter was also observed by Basist et al. (1996). There is no reason to expect that the NOAA data would overestimate snow extent during fall and early winter. As the snow cover continues to build during the months of January-March, as well as on into the melt season, agreement between the two data types continually improves. This is logical because as the winter season progresses the amount of area covered by deeper snow increases, thus enabling the microwave algorithm to detect a greater percentage of the total snow cover. As the Northern Hemisphere seasonal snow cover retreats towards the Arctic Basin during April and May the microwave data show very close agreement with the visible data. The increased accuracy during the period of spring melt is fortuitous as this is the most important period of the snow-cover season in terms of snow hydrology, thus allowing confident application of these snow water equivalent data to hydrologic forecasting and modeling. Over the 1978-2005 period the NOAA time series indicates a significant decreasing trend of -2.0% per decade in Northern Hemisphere snow-cover extent while the passive microwave gives a non-statistically significant decrease of -0.7% per decade over the same period (Fig. 5.5). The strongest seasonal signal occurs during May-August when both data sets indicate significant decreasing trends. This pattern makes physical sense in the context of increasing air temperatures during the period of maximum seasonal snow melt over the Northern Hemisphere. The geographic locations with the strongest decreasing trends within the satellite remote sensing data (Brodzik et al., 2006) include the western United States, which supports recent results by Groisman et al. (2004) and Mote et al. (2005) using in situ observations. Weekly maps of SWE from passive microwave satellite remote sensing (SSM/I) over the Canadian prairies have been consistently produced over the past 15 years. The SWE algorithms used in this program were developed for open areas with shallow snow covers, such as prairies and steppes (Goodison, 1989; Walker and Goodison, 1993) and they provide an accuracy on the order of ±10 mm, which is sufficient for operational purposes and climate-related studies. The current ability for reliable, all-weather monitoring of SWE and snow cover over the steppe and prairie regions of the world is important because these regions produce much of the world's wheat and corn, and because snow-cover fluctuations over these regions are closely linked to larger continental-scale variations in snow cover and air temperature. The development of SWE climatological information from polar orbiting passive microwave satellite sensors is not a trivial task as this requires a methodology to handle problems such as incomplete orbital data coverage and temporary wet snow events (Piwowar et al., 1999). However, since 1978 it has been possible to monitor the global fluctuation of snow cover by taking advantage of passive microwave data from both SMMR and SSM/I. This requires the adjustment of the SMMR brightness temperature data to remove a bias in computed SWE values (Derksen and Walker, 2003; Derksen et al., 2003; Armstrong and Brodzik, 2005). NSIDC has produced a global monthly SWE climatology for the period 1978-2005 by combining SMMR and SSM/I data in a common format (EASE-Grid) (Armstrong and Brodzik, 2005). The algorithms used to develop this data set include adjustments for known underestimates of snow water equivalent in forested areas based on earlier work by Chang et al. (1996). In addition, the algorithm incorporates snow extent from the NOAA data set described above in order to correct for the consistent underestimate of snow extent by the microwave algorithms during the shallow and intermittent snow-cover conditions of early winter. This snow product, available from NSIDC, includes individual files of global monthly average snow extent and water equivalent at a 25 km spatial resolution, as well as monthly climatologies describing the average snow extent, snow water equivalent, probability of occurrence, and variance. Active microwave systems (radar) provide significantly better spatial resolution (a few tens of meters) than passive systems, but radar possesses its own set of limitations as described below. Active microwave instruments operate at wavelengths of millimeters up to several tens of centimeters. Sensors measuring in the wavelength range of about 7.5-1.5 cm (frequencies of 4-18 GHz) are most commonly used in snow research. Global scale monitoring of snow cover with active microwave or radar systems has become feasible in recent decades through the advent of synthetic aperture radar (SAR) satellites. The first successful SAR data for snow studies were collected during the European SAR-850 Campaign in 1981 (Matzler and Schanda, 1984; Rott and Matzler, 1987). Recent generations of active microwave satellite sensors provide high temporal and spatial resolution, unhampered by cloud cover or darkness during the winter season. Interactions between the emitted radar pulse and the snow cover are influenced by two sets of parameters: (a) sensor parameters, including frequency, polarization, and viewing geometry and (b) snow parameters including density, liquid water content, grain size and shape, stratification, and surface roughness. These snow properties determine the dielectric properties, and therefore the backscattering characteristics. The backscatter coefficient is determined by reflection at the snow surface, scattering within the snow cover, and reflection at the snow-soil boundary; thus, the measured backscatter is a combination of surface and volume scattering. The penetration depth for a given frequency depends mainly on the liquid water content and snow density. For dry snow, maximum penetration depths vary with frequency but can be of the order of tens of meters for the SAR frequencies typically used for snow studies. Consequently, separation of dry snow and bare ground is not possible, at least with single polarization, single frequency SAR and therefore their capabilities are primarily limited to the mapping of wet snow (Rott and Kunzi, 1985). The fact that passive microwave techniques are conversely greatly limited in the presence of wet snow results in the obvious conclusion that much of the success of future work will come from a multi-sensor approach. Because of the imaging geometry of SAR sensors, data are subject to geometric distortions. These terrain-induced distortions include foreshortening, layover, and shadow effects. Therefore the dependence of backscattering on local incidence angles has to be analyzed and modeled explicitly based on DEM data of suitable spatial resolution and accuracy (Nagler and Rott, 2000). Standardized and generally acceptable correction procedures are still lacking. In this respect, polarimetric SAR has been determined to be more effective than single-polarized imagery for studying wet snow or ice surfaces, since topographic information is not required (Shi et al., 1994). An additional possibility for overcoming terrain-induced problems is to use multi-temporal or repeat pass SAR data as described by Rott and Nagler (1994), Strozzi et al. (1999), and Shi et al. (2001). 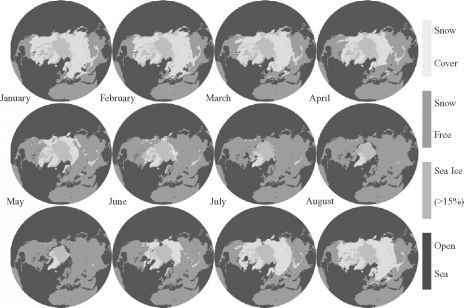 As an additional example of the applications of radar frequencies, recent work has described the specific capabilities of a spaceborne Ku - band scatterometer (12-18 GHz) in monitoring global snow cover (Nghiem and Tsai, 2001). This study was based on the analysis of data from the National Aeronautics and Space Administration (NASA) scatterometer NSCAT operated on the Advanced Earth Observing Satellite (ADEOS) from September 1996 to July 1997. The data continued to be available with the launch of the SeaWinds Ku - band scatterometer on the QuickSCAT satellite in 1999. QuickSCAT/SeaWinds provides global backscatter data with a fixed incidence angle over a swath width of 1800 km with daily coverage at latitudes greater than 37 degrees. Some examples of the application of active microwave systems to the remote sensing of snow are provided by Ulaby and Stiles (1980), Matzler and Schanda (1984), Shi et al. (1994), Nagler and Rott (2000), Rau et al. (2000), and Shi et al. (2001). For additional references and more detailed coverage of this topic, see Duguay and Pietroniro (2005) and Massom and Lubin (2006). The launch of the NASA Earth Observing System (EOS) platforms of Terra, in December of 1999, and Aqua, in May of 2002, provided additional and enhanced opportunities for mapping of snow at the global scale. Both Terra and Aqua carry a MODIS (moderate resolution imaging spectroradiometer), which provides global snow maps at a 500 m resolution as both daily and eight-day products in both a sinusoidal (500 m) and a "modelers grid" projection (0.05°) (Hall et al., 2001). Additional research products are also being developed, which include subpixel snow-covered area, albedo, and grain size (Painter et al., 2003). The Aqua platform also carries the AMSR-E (advanced microwave scanning radiometer - EOS), which has been providing passive microwave-derived snow water equivalent at the global scale since 2002 (Kelly et al., 2003). AMSR-E incorporates several enhancements to SMMR and SSM/I in that it provides twice the spatial resolution of the previous sensors as well as additional channels (AMSR channels are 6.9, 10.6, 18.7, 23.8, 36.5, and 98.0 GHz, all V and H pole). AMSR-E snow-cover products include snow extent and snow water equivalent at a 25 km spatial resolution. Data are available for both the Northern and Southern Hemispheres at three time intervals: daily, weekly maximum, and monthly average. These standard MODIS and AMSR-E snow products are available from NSIDC. As noted above, there are clear advantages and corresponding disadvantages in applying only visible or passive microwave methods to snow mapping; thus, newer products represent a blend of both MODIS and AMSR-E (Armstrong et al., 2005).